By Tanisia Morris on November 16, 2017 for Fordham News. That was the message of the Social Innovation Collaboratory’s first-ever Our Story event. The storytelling event, held on Nov. 15 at the Rose Hill campus, gave five Fordham students a unique opportunity to share powerful stories about their lives in a safe, empathetic, and empowering environment. The personal stories were as diverse as they were thought-provoking: One student shared her experience struggling to find herself as a refugee while another student recounted a family tragedy that helped him to explore the healing power of forgiveness. Sally Brander, a Fordham College at Rose Hill sophomore, shared her experiences as a Korean American adoptee grappling with the pressures of exceptionalism. For Sheron Cyrus, a U.S. Army veteran and senior at the School of Professional and Continuing Studies (PCS), sharing his experiences with PTSD was therapeutic. At the end of the event, students were asked to write down words on a Post-it note that described their impressions of the event and what they gained from hearing each other’s stories. They then posted their notes on a wall in the back of the room. “I probably crossed paths with many of these people, and I would have never imagined that they were struggling with so much,” he said. 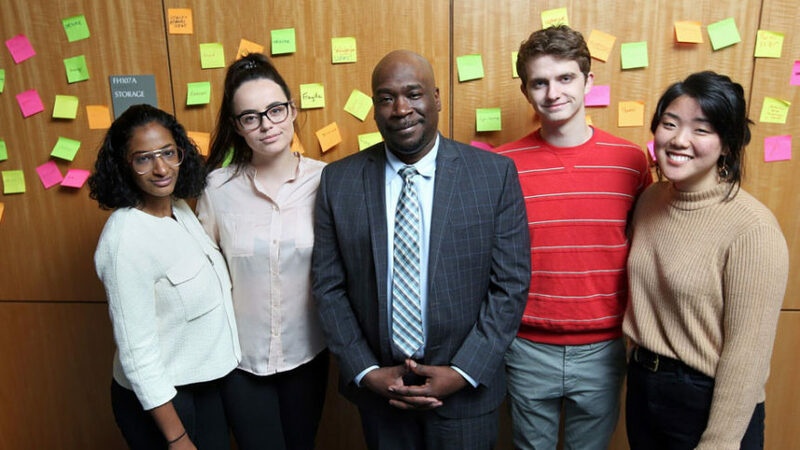 Carey Weiss, director of sustainability initiatives and social innovation, said the goal of Our Story was to create empathy and solidarity in the Fordham community, especially in moments when students face setbacks or become overwhelmed by college life.